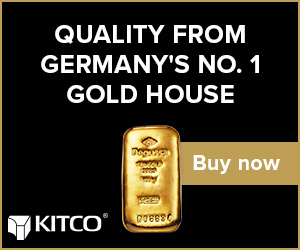 (Kitco News) - Gold prices are modestly lower in early U.S. trading Monday, on some chart consolidation after posting a three-week high and closing at a bullish weekly high close on Friday. December Comex gold was last down $2.90 an ounce at $1,354.50. September Comex silver was last up $0.223 at $20.575 an ounce. Asian stock markets were higher Monday on ideas the U.S. Federal Reserve will not be able to raise interest rates this year due to weaker U.S. economic data recently. Friday’s U.S. GDP report showed the economy grow just 1.2% in the second quarter, which was well below market expectations and boosted gold prices. European stock markets were mixed Monday. The Euro zone Markit manufacturing purchasing managers’ index (PMI) fell to 52.0 in July from 52.8 in June. A reading above 50.0 suggests expansion in the sector. The slight month-on-month decline in the PMI is being blamed on the Brexit vote in late June. There are central bank meetings in the U.K., Thailand and Australia occurring this week, which will be closely watched by the marketplace. The key “outside markets” on Monday find the U.S. dollar index trading firmer on a rebound from selling pressure seen late last week. Nymex crude oil prices weaker and hovering near Friday’s four-month low. Oil prices are trending lower and are closing in on $40.00 per barrel. U.S. economic data due for release Monday includes the U.S. manufacturing PMI, construction spending, the ISM manufacturing report on business, and the global manufacturing PMI. September silver bulls have the firm overall near-term technical advantage. Silver bulls’ next upside price breakout objective is closing futures prices above solid technical resistance at the July high of $21.225 an ounce. The next downside price breakout objective for the bears is closing prices below solid support at $19.00. First resistance is at $20.76 and then at $21.00. Next support is seen at $20.25 and then at $20.00. Wyckoff's Market Rating: 7.5.